Originally from Paris, Arnaud Ghillebaert moved to New York in September 2012. 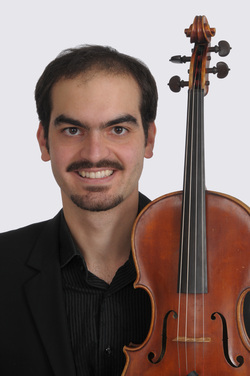 After being awarded his “premier prix” in violin and viola from various conservatories in the Paris area (St. Maur, Cachan), he went on to complete a Masters in viola and violin at the Royal College of Music in London. He continued in London playing for a year with the Southbank Sinfonia. With this same orchestra he was part of London’s National Theatre production of Tom Stoppard’s and Andre Previn’s play with music Every Good Boy Deserves Favour. He toured Europe for two summers with the Gustav Mahler Youth Orchestra under the baton of Sir Colin Davis and Herbert Bloomstedt in venues such as the Royal Albert Hall in London or the Concertgebouw in Amsterdam. As an orchestral musician he has performed regularly with The Academy of Saint Martin in the Fields (Sir Neville Mariner), The London Symphony Orchestra, The Bournemouth Sympony Orchestra, The Scottish Opera and Opera North. He performs in festivals in Italy every summer as a member of the Quartetto con Fuoco. He is currently pursuing a Doctorate in Viola performance at StonyBrook University with Nick Chords (Silkroad Ensemble) and Larry Dutton (Emerson String Quartet).